In an ideal world, everyone always works efficiently and error-free. Unfortunately, the real world can be quite different. However, precise document management improves the chances of success. In order to achieve this, your employees need the correct, up-to-date and approved documents. Protocols, procedures, work instructions, process descriptions etcetra. Fragmentation, extreme information density, and the limited shelf-life of information in knowledge-intensive organisations do not make this process any easier.The Documents & Processes module allows you to take document management to a higher level, stop unnecessary searches and get the most out of your business without costing a lot of time. With the help of document management software, employees always have access to up-to-date information. The smart search algorithms of the document management system help to prevent time-wasting and ensure that employees can perform their tasks more quickly and efficiently. This also prevents errors due to delayed, missing or incorrect information. And fewer mistakes immediately result in better quality and lower restoration costs. The complete DMS is also available via the iProva Search app; a user-friendly and easily-accessible app that ensures that your employees have access to all company documents from any location. The search for information is not the only aspect that is faster with a DMS as our Documents & Processes software. Document management, setting up new processes and the evaluation of processes are also a piece of cake. Easily guarantee ownership and assign tasks to colleagues, add documents to process elements and experience intelligent work flows. These handy work flows will help you to monitor the progress and status of processes by means of automated signaling. 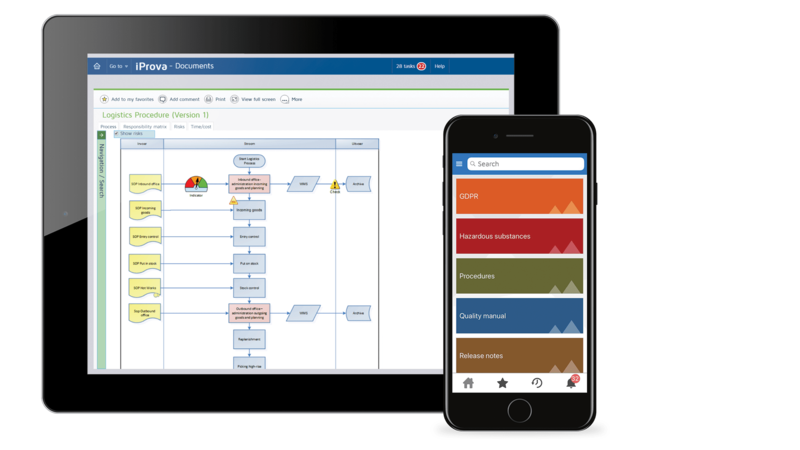 This gives you a grip on process management, allows you to avoid errors and makes you more agile for your clients. Would you like to make a difference right away? Take the step towards complete process optimisation. We have over 20 years of experience in the field of DMS in various industries. This allows us to offer the best practices in a non-binding manner, so you can start immediately. Use this knowledge to accelerate your implementation project for process management. You can start working in a smarter and more efficient manner today. Do you have questions about the module Documents & Processes? Feel free to contact us! We are glad to help you. Find documents and processes quickly thanks to our search engines and filters. Keep documents and processes up-to-date; on its own or together. Share documents with stakeholders while guaranteeing evaluation and authorisation. Smart reporting offers insight into status, progress and compliancy. Want to know more about Documents & Processes? Are you curious to find out how you can work faster by never having to search anymore? Download our Documents & Processes brochure. Libbey gladly shares their experience with our DMS to improve quality in their organisation. Information should “simply” be available anywhere anytime. All your company documents are within reach at all times using our iProva Search app. This includes access in other countries, where you might not have access to a data link. The app is very user friendly. In addition, anyone with a Documents & Processes licence has free and unlimited access to the Search app. Are you interested or would you like more information about the iProva Search app? Please contact our sales department.